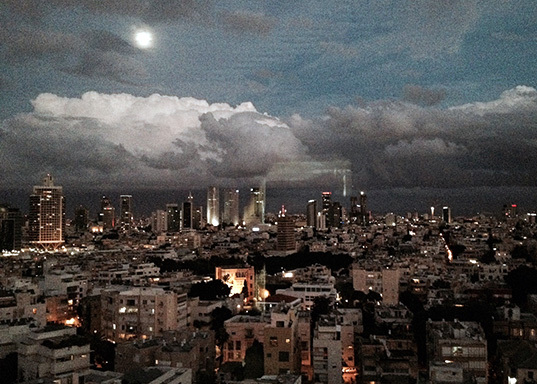 A full moon on the third day of January, 2015, floats in an El Greco sky above Tel Aviv. I’m a Fulbright Scholar to Israel at Ben-Gurion University and this is my first post on the art and science animated video I’ll be developing over the next four months. 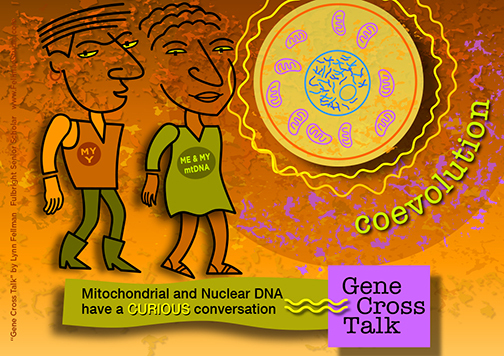 The project is about the co-evolution of mitochondrial and nuclear DNA based on research by evolutionary geneticist Professor Dan Mishmar. More about our collaboration in future posts, meanwhile here is the dramatic view outside my hotel window that greeted me on the evening I arrived in Tel Aviv. The U.S. Israeli Educational Foundation has granted me the Fulbright Scholar Award to develop a multimedia project at Ben Gurion University of the Negev. 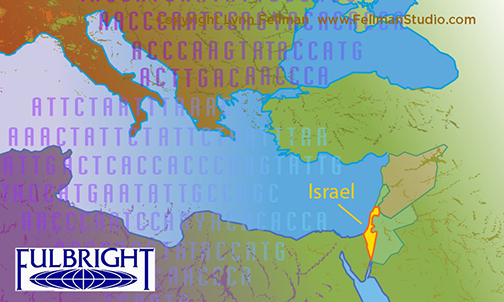 I’ll be working with Professor Dan Mishmar, evolutionary geneticist, at Ben Gurion during the 2014-2015 academic year. I’m stunned at my good fortune. Prof. Mishmar and I began discussing a collaboration at Cold Spring Harbor Lab two years ago and at other scientific meetings more recently. 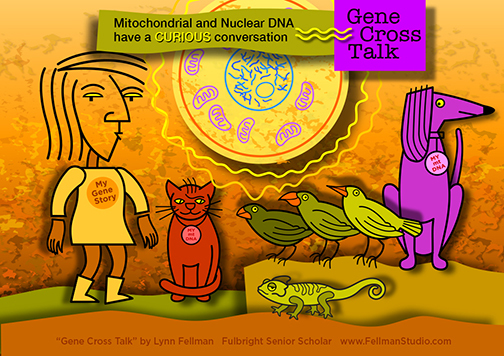 My proposal to Fulbright was the outcome of thoughtful conversations and my curiosity about the coevolution of mitochondria and nuclear DNA. The collaboration has two tangible outcomes; an animated video for viewing on the internet and a lecture using images and narrative from the video. The lecture will be presented to faculty and students at Ben-Gurion University and a modified version for the general public. The video and lecture focus on Prof Mishmar’s research on evolutionary principles that control human genetic variability in the mitochondrial genome. Click on “Fulbright Award” in the categories column on the right to see all the articles about my research project at Ben-Gurion University, Israel. Wake me up, am I dreaming? I arrived in Durham, North Carolina, at The National Evolutionary Synthesis Center (NESCent) to begin the first of two fellowships. With much ado in our society about collaborations and interdisciplinary research — NESCent is a place where it really happens. The Center attracts U. S. and international scientists for cross-disciplinary research in evolution. Professors on sabbatical, post doctoral researchers, graduate students, and a few stray outliers like me have offices in the historic area next to Duke University. Sponsored by the National Science Foundation, the Center encourages projects that address “significant, emerging, or novel questions in evolutionary science”. What am I doing at NESCent? My work is based on science in the emerging category. The new sequencing method for high quality data from archaic genomes is key information for my project. I’ll be working with scientists at NESCent, too. I’m curious to find what changes we see when comparing Neanderthal and Denisovan genomes with DNA from you and me. 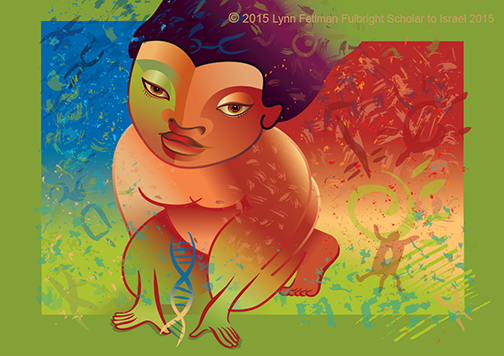 Take a look at the development of my projects Gene Stories and Visions of Neanderkin. I asked Craig McClain, marine biologist and Assistant Director of Science, what do I call the fellowship I received? He said “scholarly fellow” and that most consider the opportunity a retreat to do some of their best research. For a non-academic like me, I’ll have access to scientific literature, a chance to meet scientists, and the best part — concentrate on new work. Short version is I submitted two proposals, both were approved, then drove 1200 miles from Minneapolis to Durham. The longer, how-did-I-get-here version, began seven years ago with curiosity about science, discovery of genetics, which drove an obsession to write draw and talk about the genomics revolution. More on this later but meanwhile… don’t wake me up for surely this is a dream. 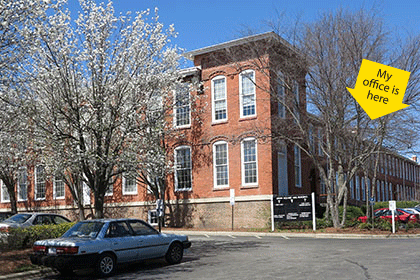 Delicate white flowers on cherry trees illuminated by blue sky and the red brick of the Old Mill buildings in Durham, North Carolina. Located near the east campus of Duke University and home to the offices of NESCent, the long red buildings were built in the 1850s as tobacco warehouses.